Clever, classic and a little country, I've recently fallen head over heels for Dapper Paper, a husband and wife design team in Raleigh, NC. Their Rules to Always Being a Gentleman print is simply genius, but I've got a real crush on this botanical invitation suite–aren't all those typefaces divine? What's your latest Etsy discovery? These are stunning...people that mix fonts so flawlessly amaze me! My latest Etsy discovery is a shop full of vintage botanical prints. I can't way to order a few as Christmas gifts! Great style! And the pattern of that envelope liner is just lovely! Loving the fun extra touch of the patterned envelope liner! I love that - especially the envelope liner! 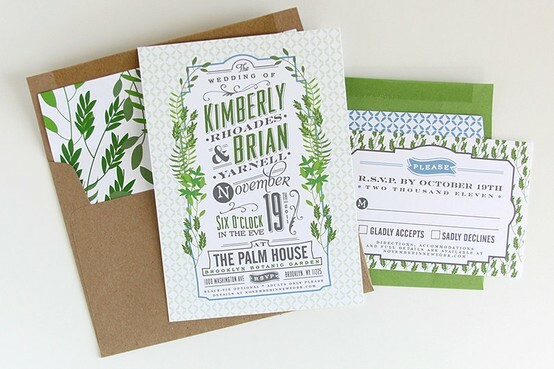 Love this invitation suite! I agree it's a little of everything lovely! Love the colors, too! Going to check out the website. Ooh, my! Great find, Lena! We've neglected Etsy as of late, but happy to find these!